Does this black floral crepe dress just radiate "FALL" or what? This dress will be in your closet for a couple seasons. It's light enough to wear during the trailing off scorching summer days we're having in Vegas right now, but heavy enough that it'll be on my "Wear in Winter" list (with tights or leggins of course). I wore this to work and then out to dinner with my husband and it felt perfect for both. You can pick up these shoes up at Target. 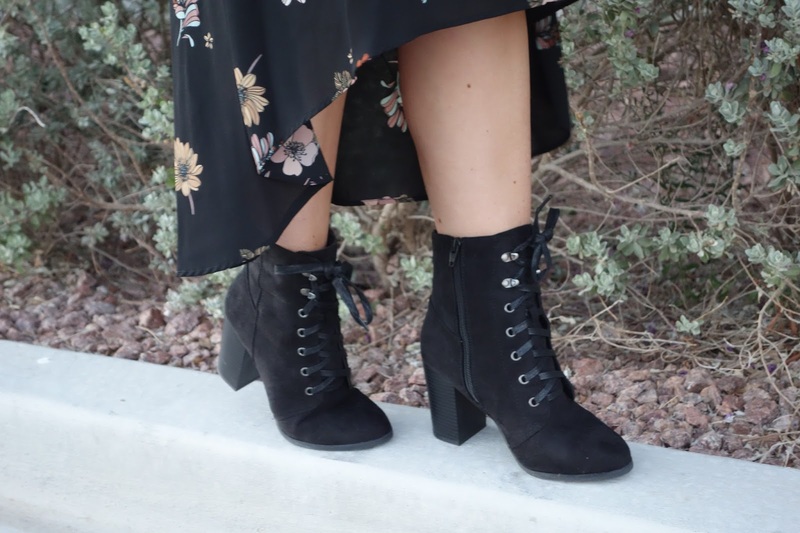 They are by far my most comfortable pair of heel booties. As always, thanks for stopping by my page! Have a great weekend. I LOVE this dress! That black floral is so classy and beautiful for fall! Love that floral is a trend for fall! Such a cute dress. Elegant and graceful. Nicely matched ensembles. Looking adorable! Whaaaat, this dress is from Target? BRB going to buy it NOW! Love the print and flowy shape. I love this dress so much! I'm going to need to run down to Target and grab one. I have aa similar pair of boots and they're my absolute favorites! Like...I've been through two pairs of them. Omg how cute is your outfit...I just love the floral print. And those boots are so gorgeous! I love the floral print of this! So cute with the boots too. Yes! I adore this dress, and I love the subtle detail of the leather-trimmed collar...so funky! Definitely. DO IT! Such a good price for a gorg dress! This dress is so pretty!! I love that it can be transitioned from work to date night! Love this dress! Perfect for fall! What a gorgeous fall look. I love that pattern. Me too. I love that it's on black. Thank you Elise! You look so stunning, I love that dress its perfect for fall. I have been looking for a dress to wear to an upcoming baby shower and was considering a floral dress, now you have made my decision easier. Yaaaas! Get it. That sounds perfect! Me too!! Thank you so much! Cute dress! I love how it is longer in the back. It looks really cute with those boots! Me too. It's flowy with a gorg pattern, my dream! Love that dress... perfect for the holidays. You look gorgeous! This outfit reminds me of the 90's so much and I love it! Haha. It does doesn't it? Love it! Yay for floral! I'm just starting to get a few floral pieces for my wardrobe and absolutely love the trend! Me too. Floral EVERYWHERE. I'm loving it! Yes! Get it. It is so perfect for fall and is super flattering. I just love dark florals for fall! They add such spice to an outfit! You look gorgeous! I'm loving your vibe. Those florals are such a nice touch! Hi Melisa :) Thank you so much! What a gorgeous dress!! You look so pretty girl :) Have a wonderful day! Thanks Monika. You are so sweet!!! This is the perfect fall dress! I love your booties too!